Eberswalde can be reached via Bundesstraße B2, which connects Berlin with Bernau, Biesenthal, Eberswalde, Angermünde and Schwedt. 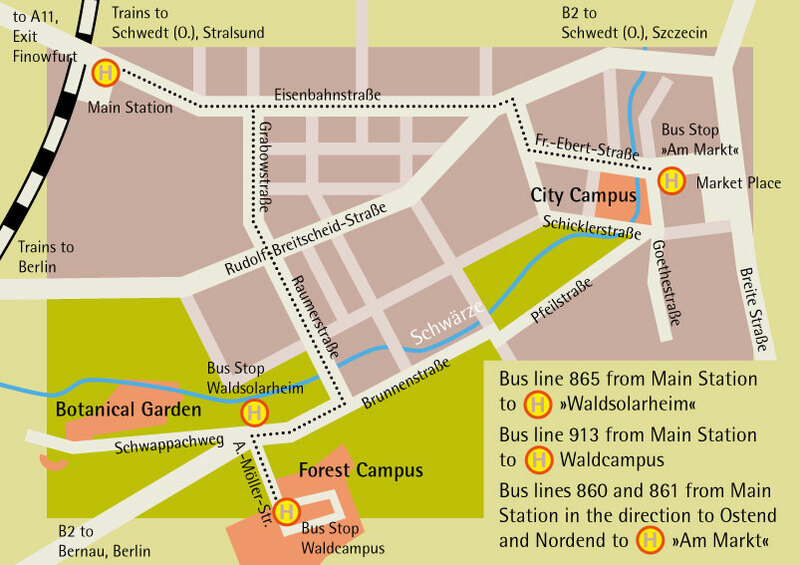 Coming from Berlin and driving northwards, you will be led directly to Eberswalde. Coming from the motorway-ring-road A10 around Berlin (Berliner Ring) you can also take the motorway A11 (Autobahn). This motorway leads to Stettin (Szczecin, Poland) and brings you close to Eberswalde. Exit 12 "Finowfurt" takes you to the B167 towards Bad Freienwalde. Road signs already announce Eberswalde, which is reached after about 10 kilometres.